We are the proud owners of a new set of house keys! We don’t move in for a few more days, yet, but we’ve been visiting here and there, to check it all out, to get ready for moving day, and to meet with a repair person or cleaner or two. This weekend, we went over to measure some things and to prep the one room that we’ll be painting for it’s new color. There we were. I was busy measuring. Paul was busy applying painter’s tape in the new baby’s room. Meanwhile, unphased by our concentration on our respective tasks, Emma’s idea of a good time was running around and around in circles in several rooms, playing chase with me, and laughing all the while. It’s nice to see the moving process through our young child’s eyes. It helps to ease my moving anxiety to see that, for her, this is all about new places to explore, new boxes to play and hide in, and new stairs on which to go up and down. We’re all really looking forward to getting settled into our new place! We got to overtime. The game was tied. We won the coin flip and possession of the ball. But. Instead, that one was intercepted. All Packer fans can do, as a sports psychologist interviewed on a local radio station this morning advised, is to focus on what’s meaningful and positive in our lives right now. Hmmm. In case anyone missed it, I haven’t posted here (or even had time for my old passion of frequent picture taking) for over two months!!!! But I am. I attended a lunch meeting of working moms recently and heard a speech by a “life coach”. She talked about the fact that we all find ourselves, throughout our lives, in different “seasons.” These seasons are affected by our obligations and choices, as well as by those of our family members. And I know that on the sleep-getting front, it’s only going to get worse before it gets better. Having already had a baby once, I now have no more illusions that only other people can’t get sleep when a new baby is in the house. Once we get settled in there, I’m sure everything will unfold peacefully. And once the baby comes, I’ll remember that there’s an awful lot of sweetness to brighten up those tired early days. 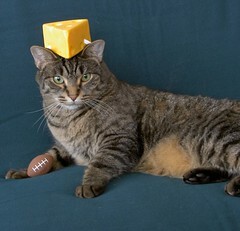 You are currently browsing the cheese.rox weblog archives for January, 2008.